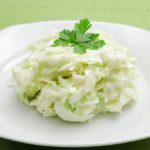 A quick and easy recipe to make delicious creamy cole slaw. Place shredded cabbage in a large bowl. Stir together mayonnaise, vinegar, and sugar in a small bowl until smooth. Pour mayonnaise mixture over cabbage and stir to coat thoroughly. Refrigerate for at least 1 hour, stirring occasionally.